When thinking of true female pioneers, a few women might cross your mind — historically, you might think of strong figures like Margaret Sanger, Amelia Earhart, and Madeleine Albright, the latter of which was the very first female Secretary of State. Without a doubt, Mary Lou Retton should be added to the list of famous, influential females — after all, Retton was the first American woman to win a gold medal in gymnastics back in 1984 at the Los Angeles Olympics. What is Mary Lou Retton doing these days? While she retired from the sport soon after (at the ripe old age of 18), Retton still has quite the active life, making sure to to attach her famous name to good causes and brands that she personally believes in. But her main job right now? Being a mother. Her day is filled with "typical mom stuff," she tells Bustle. With four daughters of her own (McKenna, Emma, Shayla, and Skyla) with husband Shannon Kelley, Retton is all about balancing motherhood and her still-blossoming career. 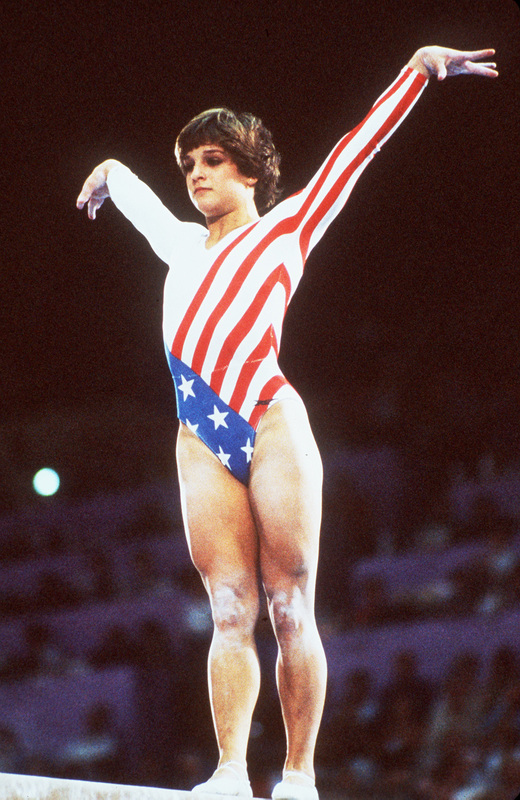 Besides being the first female gymnast to win a gold for the United States, Retton has another famous "first" on her resume — she was the first woman to be featured on a box of Wheaties. The space is only reserved for the best of the best, and Retton helped prove that women can, and should, receive the same honor. So what has the famous gymnast been up to recently? Here's how her life has changed in the last few years. These days, Retton says she puts motherhood duties above all else. In fact, a lot of her daily routine focuses around school drop-off, and school pick-up. "It's a hectic, crazy morning getting them off to school," Retton says. "I'm a big cook, I cook every night... I love my life. I'm exactly where I want to be." For the record, Retton, who self-defines herself as a "gym mom," definitely put her kids through gymnastics when they were younger, starting with a Mommy and Me class. "Why wouldn't I put my children in the sport I love?" Retton says. Of course, if they ended up hating it, she was prepped to pull them out — but luckily enough, three out of her four daughters loved the sport just as much as she did. Gymnastics aside, Retton was in a few movies back in her heyday — a big one being the Christmas film Scrooged, starring Bill Murray. Her role? Tiny Tim. "It was so fun," Retton says. "I was fresh off of the Olympics. I was so nervous, Bill Murray was so wonderful... He ad-libbed that whole movie, by the way." Retton took the experience for what it was, as the few Hollywood roles she had scored had her playing — well — her. While the cinema life was definitely fun, Retton says that she never really got the acting bug, and never even thought of relocating to Hollywood with her family to pursue acting full time. These days, she doesn't really get scripts to read over, but still gets calls about making appearances on occasion. "There's something special in being first," Retton says. "You open the door for all other women. What a prestigious honor. Icons were put on Wheaties boxes." The company gave her the very first box off the press, which she still has today — cherished, behind a Plexiglass box. Of course, she was well stocked up on Wheaties for quite some time, noting that her historical appearance lead to box-loads of cereal filling her house. Not many people can say they've retired in their teenage years — and Retton says it was definitely an experience she remembers quite well. "The first night I did not go to gymnastics practice, and I sat down, and thought... this is what normal people do," she says, adding that she ended up watching a sitcom (The Cosby Show, to be exact) to pass the time. But for Retton, things normalized a bit when she went to college. Her advice for gymnasts who are also leaving the sport after the Olympics is, pretty much, to take it in while you can. "If this is your last Olympics and you're retiring... enjoy it," Retton advises, wanting fellow gymnasts to really take in the fact that their Olympics floor routine might be their last one. "Gymnastics is a marathon," she adds. "You go home, and it's a completely different stage of your life." Those interested can go to the link through NaturesBounty.com, write themselves a letter for the future, and share it through social media. "It's something that I did, that I'm doing," Retton says. "[And] we're going to thank ourselves for that in the future."